Throughout women's reproductive lives, the body undergoes significant reproductive changes, which prompt hormonal fluctuations and result in a series of unpleasant symptoms. Menopause is the most characteristic example of this. While there are many methods to bring relief from said maladies, hormone replacement therapy (HRT) is one of the most popularly prescribed treatment options for women passing through periods of hormonal flux. The following information will help women become familiar with HRT, from learning about the hormone therapy and the common hormones used to discussing its role during menopause and alternative options that exist. Menopausal symptoms are caused by the fluctuating levels of hormones. Substituting synthetic hormones for natural ones, as in HRT, has many risks and can have a range of side effects. Hormone replacement therapy is a treatment that introduces synthetic hormones into the body. It addresses natural hormone deficiency and provides relief from problematic menopausal symptoms. There are various types of HRT: implants; topical creams, gels, and sprays; pills and tablets; skin patches; or vaginal rings, creams, and suppositories. The type prescribed is based on symptoms experienced and a woman's personal preference. Click on the following link to learn more about hormone replacement therapy or keep reading to find out about the most common hormones used in replacement therapy. When administered for a short period of time in the lowest dosage possible, HRT can help fight osteoporosis and provide relief from menopause symptoms. Click on the following link to learn more common hormones for replacement therapy or keep reading to find out about estrogen hormone replacement therapy. Your doctor will prescribe doses of HRT.However, HRT carries increased risk of heart disease, breast cancer, and stroke.There are plenty of natural remedies that can bring the same benefits without the potentially side effects. Most of the time, estrogen is combined with progesterone to create a compound hormone replacement therapy. However, for women who have undergone a hysterectomy, it is safe to take estrogen-only hormone therapy. Click on the following link to discover important details about estrogen replacement therapy for menopausal symptom relief, or continue reading to find out about this hormone therapy's side effects. Although ERT may seem like a dream come true for women suffering from a hormonal deficiency, improper or prolonged use can cause adverse reactions. On the other hand, long-term use may cause more serious health conditions, such as blood clotting; breast, uterine, or ovarian cancer; thyroid disorders; and more. Click on the following link to learn more about estrogen replacement therapy side effects, or keep reading about another viable HRT option, progesterone replacement therapy. Synthetic hormones are hormones that are artificially created to help boost women's hormone levels.They can help overcome menopause symptoms.However, there are disadvantages associated with receiving synthetic hormones. Progesterone replacement therapy (PRT) is the introduction of exogenous progesterone into the body to replenish the hormone's insufficient levels. Although its use is recommended alongside estrogen replacement therapy, PRT can be taken on its own, although treatment progress should still be monitored closely with a trusted doctor. Click on the following link to learn more about progesterone replacement therapy for hormonal imbalance, or continue reading to find out about progesterone hormone therapy side effects. Even though progesterone HRT is considered a safer alternative to estrogen hormone replacement, PRT does not come without its risk of use. Whereas, use for an extended period of time without proper dose adjustment may lead to jaundice, liver damage, abnormal uterine bleeding, or congestive heart failure. Yet again, this list is not exclusive. Click on the following link to learn more about progesterone replacement therapy side effects, or keep reading to learn more about the third hormone prescribed for HRT, testosterone. 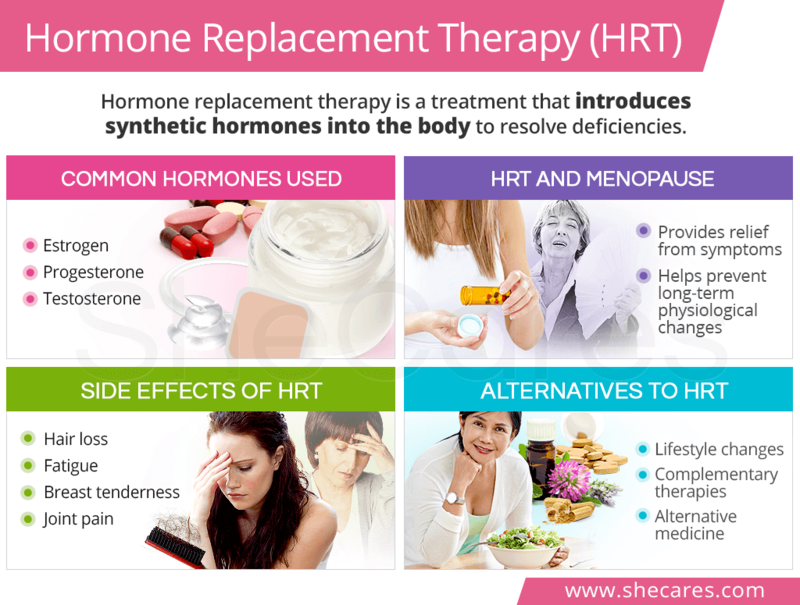 Hormone replacement therapy is often used to treat an estrogen deficiency in women.HRT introduces artificial hormones into women's bodies to settle the onset of hormonal imbalances..
Testosterone replacement therapy (TRT) is a hormone therapy that replaces endogenous testosterone with external substitutions in order to bring a woman's body out of hormonal deficit. In general, doctors rarely prescribe stand-alone testosterone for women. Instead, they recommend a combination of all three hormones if testosterone levels are too low. Click on the following link to learn more reputable information about testosterone replacement therapy for women, or continue reading to find out about the dire side effects of testosterone hormone therapy. As with estrogen and progesterone replacement therapy, women taking synthetic testosterone are likely to have side effects if the dosage is not monitored and adjusted accordingly. Moreover, prolonged use of synthetic androgens such as testosterone could lead to serious health conditions, such as liver damage, heart disease, breast cancer, and more. Click on the following link to learn more about the side effects of testosterone hormone replacement therapy, or continue on to the next section about HRT and menopause. Menopause is the time in a woman's life where her body makes the transition from being fertile to infertile. ERT is the medical procedure that introduce synthetic hormones into the body. Nevertheless, substituting synthetic hormones for natural ones can increase the risk of developing breast, ovarian, or endometrial cancer; strokes; blood clots; gallstones; and more, especially if used for prolonged periods of time. Therefore, it is recommended that hormone replacement therapy be used for only a short period of time and at a low dosage before re-assessment of a menopausal woman's health status. For further accentuation on the topic, click on the following link to learn more concerning menopause hormone replacement, or keep reading to find out about natural hormone replacement therapy. Natural hormone replacement therapy, also known as bioidentical hormone replacement therapy (BHRT), is a hormone therapy that uses plant- or animal-based compounds to create hormones that are chemically identical to the body's. While BHRT can be personalized to a woman's specific needs, natural hormone treatment has not proven safer or more effective than traditional HRT, and not all BHRT options are FDA-approved. Click on the following link to learn more natural hormone replacement therapy, or keep reading to find out about alternatives to hormone replacement therapy. Recently, hormone replacement therapy (HRT) has caused uproar in the community. However, there are other natural treatments. For example, yoga is an exercise based on the principles of breathing that may amend hormonal imbalance. Also, women can treat the root cause of hormonal imbalance by introducing natural herbs into their diets. Many women in need of symptom relief may wish to pursue lower-risk HRT alternatives before taking the risk of using synthetic hormones. Accordingly, alternatives to hormone replacement therapy are broken down into three categories: lifestyle changes, complementary therapies, and alternative medicine. Employing wholesome habits, an improved diet rich in the necessary macronutrients and phytoestrogens, and a more active lifestyle will have positive effects on hormonal balance. Acupuncture, biofeedback, and stress-reduction therapies of yoga, tai chi, muscle relaxation, and deep breathing will have beneficial effects on endocrine system health. Phytoestrogenic supplements and hormone-regulating supplements are the leading types of alternative medicine for menopause symptom relief. Both involve little to no risk and are considered safer and more effective than hormone replacement therapy when combined with aforementioned changes. Click on this link for more information about alternatives to hormone replacement therapy so that you can find a natural, lasting solution to hormonal imbalance symptoms.